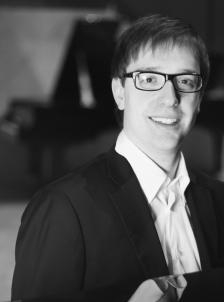 Pianist Sven Bauer, currently studying in the renowned piano class of Prof. Lev Natochenny in Frankfurt, was born in Schwäbisch Hall in 1989 and is the winner of various prizes at international competitions. He received the Grand Prix of the International competition – festival „Music without limits“ in Druskininkai, Lithuania, and the first prize at the Concours International de Piano in Montrond les Bains, France, among others. Most recently he was awarded the first prize at the Alexandre Scriabine Concours International de Piano in Paris and at the Concorso Pianistico Internazionale “Città di San Donà di Piave” (Italy). His concert activities have led the young pianist to world-famous concert halls including the Alte Oper Frankfurt, the Wiener Musikverein, the Royal Albert Hall London and the Carnegie Hall New York, and to exceptional places such as the production hall of a Swiss metal construction company and the Acropolis Museum Athens. Besides, Sven Bauer is also actively involved in chamber music: in 2010 he won the chamber music competition of the Polytechnische Gesellschaft e.V. as well as the sponsorship award of the city of Bad Homburg. The following year he made his debut on Deutschlandradio Kultur. As a chamber music partner, Sven Bauer plays with Jouko Harjanne, Allen Vizzutti, Enrique Crespo, Fabrice Millischer and Joseph Alessi, among others. The young pianist obtains important musical impulses through master classes and meetings with renowned pianists and professors such as Lev Natochenny, Igor Lazko, Andrzej Jasinski, Oxana Yablonskaya, Karl-Heinz Kämmerling, Robert Levin and Dimitri Bashkirov. From 2005 to 2009 Sven Bauer was a “young student” at the Hochschule für Musik und Darstellende Kunst in Frankfurt/Main, in 2015 he was accepted to the postgraduate study programme Konzertexamen.